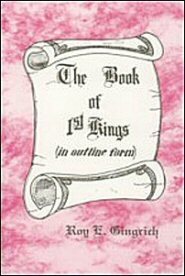 The first half of First Kings sets the life of King Solomon, the wisest man who ever lived and the writer of three of the Wisdom Books of the Bible: Proverbs, Ecclesiastes, and The Song of Solomon. The second half of First Kings tells us of the decline of the Kingdom of Israel after Solomon’s death. The author’s treatment of First Kings is fresh and stimulating because in his discussion he includes many personal elements in the lives of Solomon and the other kings. Mr. Gingrich helps to make these characters live for the reader by noting much detail which a casual reader might fail to observe. The applications to Christian living add to the value of this book, another in along list of outline books which Mr. Gingrich has already published.